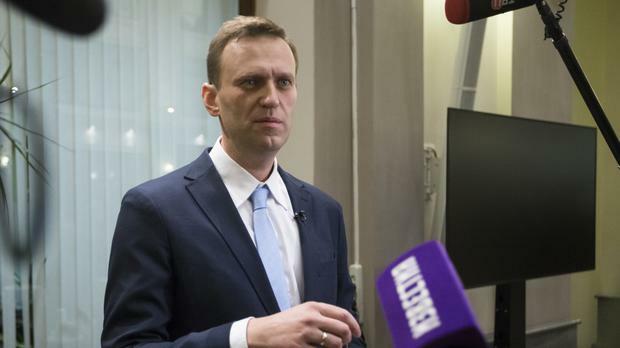 Russian officials should review opposition leader Alexei Navalny's calls for an election boycott to see if they might be breaking the law, the Kremlin has said. In a widely anticipated decision, Russia's top election body ruled on Monday to formally bar anti-corruption crusader Mr Navalny from running in the presidential election next March. Mr Navalny promptly put out a video statement, saying the ban shows that President Vladimir "Putin is terribly scared and is afraid of running against me", and called on his supporters to stay away from the vote in protest. Opinion polls say Mr Putin should easily win the March vote. Putin spokesman Dmitry Peskov on Tuesday would not comment on the Election Commission's decision to bar Mr Navalny but said the "calls for boycott ought to be carefully studied to see if they are breaking the law". Mr Peskov also rejected suggestions that Mr Navalny's absence on the ballot could dent the legitimacy of Mr Putin's possible re-election. The Russian law doesn't say calls for an election boycott are illegal, but authorities last year blocked access to several web-sites calling for the boycott. Mr Navalny rose to prominence in 2009 with investigations into official corruption and became a protest leader when hundreds of thousands took to the streets across Russia in 2011 to protest electoral fraud. A few years later and after several short-term spells in jail, Mr Navalny faced two separate sets of charges of fraud which were viewed as political retribution aimed to bar him from running for office. In his only official campaign before his first conviction took effect, Mr Navalny garnered 30% of the vote in the race for Moscow mayor in 2013.